Our 7 day weather forecast for Amsterdam updated throughout the day, making it ideal for planning leisure activities, travel and events. Read more about our weather forecasts. On Monday 22nd April 2019 the sun will rise at 06:29 and will set at 20:51. It will be a mild day, with temperatures reaching around 22.6°C. Today is expected to be a dry day, with a very low chance of rain. It will be quite a breezy day, with a maximum expected wind speed of 31mph. On Tuesday 23rd April 2019 the sun will rise at 06:27 and will set at 20:53. It will be a mild day, with temperatures reaching around 19.3°C. Today is expected to be a dry day, with a very low chance of rain. There could be quite a strong breeze in the air today, with a maximum expected wind speed of 26mph. On Wednesday 24th April 2019 the sun will rise at 06:25 and will set at 20:55. It will be a mild day, with temperatures reaching around 20°C. Some moderate to heavy rain is expected, 6mm of rainfall is possible today. It will be quite a breezy day, with a maximum expected wind speed of 21mph. On Thursday 25th April 2019 the sun will rise at 06:23 and will set at 20:56. It will be a mild day, with temperatures reaching around 16°C. A few showers are expected, 3mm of rainfall is possible today. It could be quite a gusty day today, with a maximum expected wind speed of 34mph. On Friday 26th April 2019 the sun will rise at 06:21 and will set at 20:58. It will be a mild day, with temperatures reaching around 15.1°C. A light shower is possible, 1mm of rainfall is possible today. It will be quite a breezy day, with a maximum expected wind speed of 15mph. On Saturday 27th April 2019 the sun will rise at 06:19 and will set at 21:00. It will be a mild day, with temperatures reaching around 12.2°C. Some moderate to heavy rain is expected, 6mm of rainfall is possible today. It will be quite a breezy day, with a maximum expected wind speed of 24mph. On Sunday 28th April 2019 the sun will rise at 06:16 and will set at 21:01. It will be a mild day, with temperatures reaching around 12°C. A few showers are expected, 4mm of rainfall is possible today. It will be quite a breezy day, with a maximum expected wind speed of 17mph. On Monday 29th April 2019 the sun will rise at 06:14 and will set at 21:03. It will be a mild day, with temperatures reaching around 8.8°C. Today is expected to be a dry day, with a very low chance of rain. There will be a gentle breeze in the air today, with a maximum expected wind speed of 13mph. Our weather forecast for Amsterdam is updated throughout the day and has been found to be very reliable for planning activities such as days out, leisure, travel, events, fishing, golf and gardening. 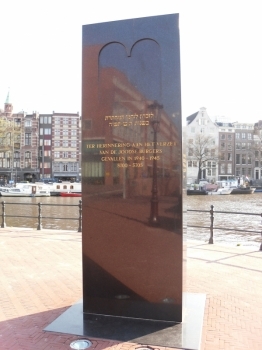 See important sites and monuments relating to the Nazi occupation of Amsterdam (1940-45). Let us be your guide and inform you about this traumatic episode in the Dutch capital's long history. An ideal tour for visitors who like to go off the beaten track and want to learn more about this important aspect of the city's past. * Liberated by the Canadians. We walk with small groups, maximum 6/7. Minimum 2 people, 25 Euro pp.